Welcome to the Ribble Valley Remembrance site. A large amount of information is available through the Menus on the left and those above, spanning not only the World War 2 years but much of the research needed to put this web site together, including historical articles, official records, photographs, video and much more. We hope you enjoy it. 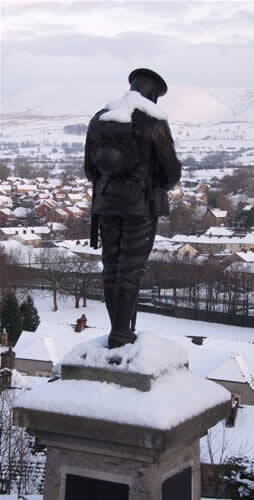 We have produced this web site to commemorate the men and women from the Ribble Valley who gave their lives fighting in the Second World War, and subsequent conflicts. After finding that there was no Book of Remembrance to honour those from Clitheroe who fell in the Second World War. Mel Diack MBE who is Chairman of the Clitheroe Youth Forum suggested that there should be a Remembrance Book. They all met at the Arts and Crafts studio in Clitheroe to find out what could be done. There the decision to make a War Memorial book was made. At the meeting it was decided to also make a website along with a film of the project. We were helped to create and manage the website by Peter Dunn of ITzone. Furthermore it was decided that a book would be made in Braille for those who are visually impaired and for this go into the Clitheroe Library. For this we brought in Chris Tattersall of Braille IT, who would also be helped by some of the younger youth members in the Clitheroe Youth group.